Siladen is a small island to the northeast of Bunaken, it offers deep coral covered walls and great marine life. 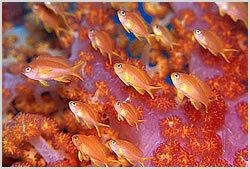 There is a vertical drop off on the southern side of the island with plently of hard and soft coral coverage. Plenty of fish including butterfly fish, angelfish, parrotfish and wrasse. Bigger varieties come in when the currents are stronger, jacks, tuna and the occasional reef sharks. Also a lot of smaller life to be found here such as nudibranchs galore, shrimps and crabs.